We (L&D) spend a great deal of time and resources to transfer knowledge and boost workforce capability through training solutions. We scramble to innovate; to build more, better, faster solutions that can only be consumed at a standstill…off-task…out of the workflow…restraining the very thing we chase – Productivity. Accelerating Productivity implies forward motion and the context where this motion should occur is where Productivity is optimized – Point-of-Work. Accelerating productivity is optimized when opportunities to learn are seamlessly, frictionlessly, and ubiquitously connected to opportunities to perform. That statement is exactly why I write about a dynamic “Learning Performance” ecosystem. The dynamics are of continuous change and rapidly increasing demand that drive a level of agility and responsiveness the Training paradigm cannot satisfy. The bulk of what needs to be supported is out of scope. If we are chasing productivity, that implies we are behind our quarry, and if we catch it (the workforce) they have to stop to learn. If we are accelerating productivity, that implies we’ve already defined (assessed performance needs) what we are accelerating…what is restraining it…and have intentionally-designed solution assets and productivity acceleration technology in place that are integrated with and embedded inside the workflows in lock-step with the performers and aligned with known moments of need. A Point-of-Work Solution Discipline addresses the dynamics of our ecosystem and optimizes whatever agile design methods (5 Moments of Need or 70:20:10) already in play. This discipline represents a “change” in perspective for both L&D as well as our operational stakeholders who often hold fast to the belief that training drives performance. It doesn’t…it promotes potential at levels 1&2. 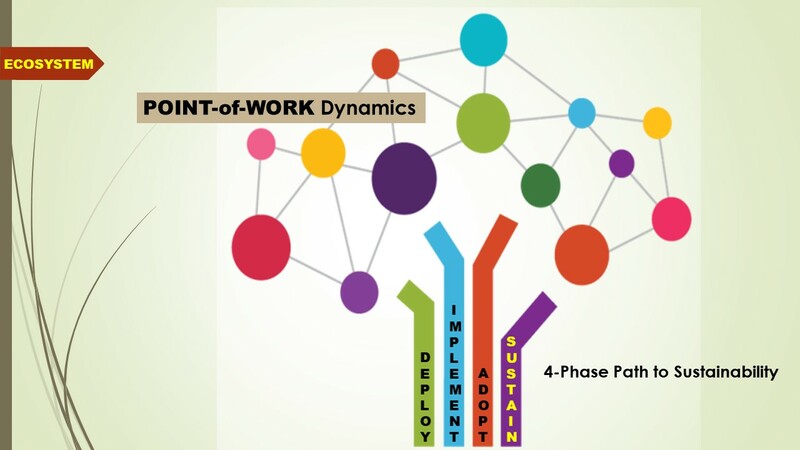 Point-of-Work is where measurable impact at levels 3&4 manifest. Glowing level 1&2 Training evaluations prove only one thing…we’re busy chasing a parked car…instead of a dynamic, moving workforce. Sorry if that tweaks anyone’s sensibilities, but it is my hard-earned experiences that have proven that if we want to sustain workforce capability we have to listen to and engage with the Voice of the Performer at Point-of-Work versus the Voice of the Learner. We talk a lot about boosting employee engagement and making learning more engaging. Let’s shift our engagement focus to where the workforce works; enabling successful performance in the workflow lifts up employee satisfaction through job satisfaction…and accelerates productivity. Methinks that is the kind of engagement we really want to sustain. Why would we continue to chase parked cars? ← ﻿Is Your L&D Function Equipped to Be a Disrupter…or a Disruptee?